Kayla is 16 and has been to more foster homes than she can count on one hand. Strange things happen around her, some might call it a talent, some a curse. But no matter what you call it, her talents are the reason no family wants to keep her for a long time. Kayla is the main character of the fantasy thriller Eden Wakes by C.S. Harte (the first in a series) and will soon learn that going from one foster home to the next wasn't such a bad problem at all - compared to what is waiting for her. After we learn about her past, and her budding romance with her new foster brother, Kayla is abruptly taken to a special place in which nothing is as it seems. Literally. It is a world in which you can travel to any place you want - kind of like a Holodeck in Star Trek, just in a magical, a bit more complicated way. Kayla meets some interesting characters who also have special talents, and teachers who want to help her to learn how to use her talents in a controlled manner. However, there is something not quite right with this "school" for gifted kids and finding a way out proves harder than Kayla would have thought. 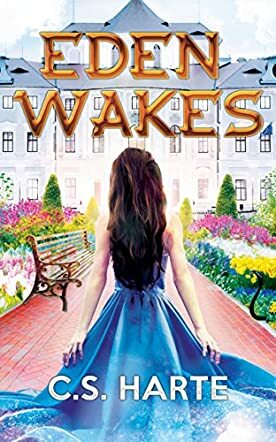 Eden Wakes by C.S. Harte isn't just a story for teenagers and young adults. Anyone who loves a good mix of fantasy and paranormal with interesting characters will feel right at home here. I immediately liked Kayla (and also Masa, of whom I would have loved to see a lot more - he's awesome!). She had a hard childhood and her teenage years weren't much better because she was always someone who was different from the mainstream. Kayla is a well written character who has to make some tough decisions, and who has to deal with more than someone her age should. C.S. Harte sometimes leads readers astray, and then you don't know what is real and what not (in the world of the book, obviously). It's nice to be surprised and there are some surprise in this story; some nice, some not so nice. And some might lead you to having murderous thoughts about the author, which shows that the story does get to you and involves you emotionally. If I come across the second book in this series, I'll read it for sure!